Unfortunately, even with today's modern technological innovations, garage door accidents still occur from time to time. The wear and tear these systems are under make it inevitable that some component will eventually break down unexpectedly. Aside from regular maintenance, which you should definitely opt for in order to keep your door in the best condition possible, there are ways you can avoid a lot of potential accidents, and all they require is some awareness and forethought on your part. 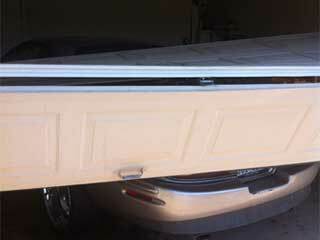 The springs that support the weight of your garage door panels are under a tremendous amount of stress. Therefore, they can end up breaking and will hurt or damage any person or object that's nearby when that happens. With routine professional maintenance, you can ensure they stay in a good working condition, but that doesn't mean that you can touch them while your door is open or close. Not even to test their tension level. Your garage door springs are not toys. If you want to check whether your garage door is closing or opening properly, you don't have to stand underneath the heavy panel. They usually weigh upwards of two or even three hundred pounds. Your garage door springs and cables will certainly work reliably if they are maintained properly, but there's always a chance, however minuscule, that some defect will cause them to break. Don't take that needless risk. Your automatic garage door uses a pair of safety sensors in order to detect obstacles that are blocking its path. These are delicate components, and they can become misaligned, which will result in their inability to properly perform their job. Make sure they are positioned correctly by placing an object under the door and ordering it to close. If your door closes without hesitation, then your sensors need to be realigned. The best advice we have to offer is a simple one. Don't try to do something you're not trained to do. Garage doors are complex systems, and they require special tools and expertise in order to properly repair or install. When something is wrong with them, give our experts at Garage Door Repair Arlington a call. We'll make sure every part of your door continues functioning optimally.